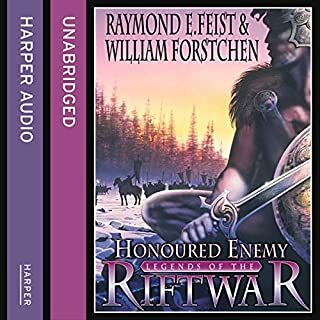 The penultimate volume of the mighty Riftwar Cycle. War rages in Midkemia but behind the chaos there is disquieting evidence of dark forces at work. Jim Dasher’s usually infallible intelligence network has been cleverly dismantled; nowhere is safe. He feels that the world is coming apart at the seams and is helpless to protect his nation. Quiet palace coups are underway in Roldem and Rillanon; and King Gregory of the Isles has yet to produce an heir. In each kingdom a single petty noble has risen from obscurity to threaten the throne.Lord Hal of Crydee and his great friend Ty Hawkins, champion swordsman of the Masters’ Court, are entrusted with the task of smuggling Princess Stephané and her lady-in-waiting, the lovely but mysterious Lady Gabriella, out of Roldem to a place of greater safety. But is there any safe haven to be found? Meanwhile, Hal’s younger brothers Martin and Brendan are attempting to hold the strategic city of Ylith against an onslaught of Keshian Dog Soldiers, and a mysterious force from beneath the sea. The Kingdom might lose Crydee and recover; but if Ylith falls, all is lost.An unknown player appears to orchestrating these conflicts. Can Pug and the Conclave of Shadows track down this source before Midkemia is destroyed? So, the only issue i have is with the change in narrator. No slight intended to either voice narrator, but the difference between the two took me a while to overcome before i could settle back into the story. Once I adjusted, great narration and story again. Feist is a master and this series his magnum opus. 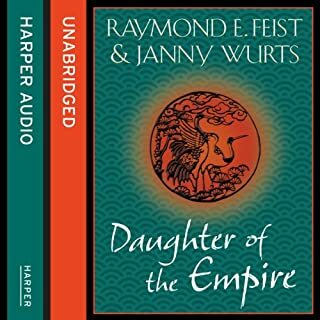 Really undervalued on audible. A Good read overall but this chap simply isn't to the calibre of Peter Joyce. narrator was terrible sounds like a 15 yo boy. narrator was terrible for this style of story. he does no accents or voices. This maybe an unfair review. The book is great this is not a review of the work by Raymond. While the narrator himself isn't bad at his job, he does NOT belong in this series. It is so disappointing and jarring to have a narrator switch in the middle (in this case the end) of a series. It makes it worse when things are not pronounced the same way, if this were the same even in that small way it would make it much more pleasant to listen to. what happened to Peter Joice? Sadly the narrator is just not the same! Pronounces everything differently and talks so fast I had trouble keeping up. So back to reading I went, great story!! Loved every bit as always. Such a shame about the change in narrator I got so used to his soothing well enunciated timed just right voice! Great story but why change the Narrative, disappointed. Putting aside the major issue with the change of Narrator the book it Critical this close to the end the Riftwar Cycle. For more than 20 books, Peter Joyce narrated this series and while I’m sure John Meagher is a good narrator, his style is so different from Joyce that it clashed with the rest of the series. Why change the narrator in the series? It just feels strange or wrong. 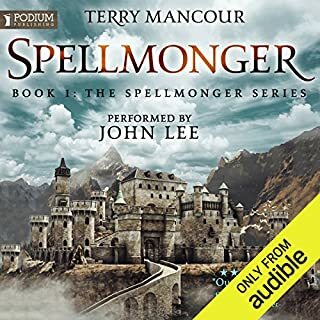 The new narrator, Jhon Meagher isn't bad, he just feels wrong for the book when his younger voice and different pronounciations are there in stead of what I expected. I hope Peter Joyce returns. This mystery story was a thriller. Not what I expected. I have to start the next book now. Bye. A dry, uninspired reading. Most voice characterisations were minor variations, and I was left disappointed. my mistake, this is part of the series, also works as a stand alone. A great book, ruined by the narrator. 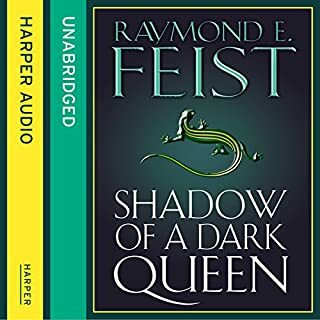 Great book by Feist as always, but dreadful narration. The guy needs to learn how read clearly and consistently. Sometimes staccato, other times in a sine-wave of speed, other so fast it's difficult to know when a breath would be taken. Also he needs to learn how to pronounce certain words, as he's clearly guessing. Loved the book, hated tge narration. Changing the narrator was the main issue with this, made it feel somehow childish and did not have the gravitas that the book should have had. Its a pity that one out of the whole series is different. Lots of issues with pronunciation, timing, changes between paragraphs/sections not being clear and at one point Magnus turned into Marcus. There is also an issue with this version of the book that is noted on the authors site. That is not the narrators fault but surely you could have used one of the copy's that are corrected. It is an obvious mistake and causes a lot of confusion in the story. But the story is part of a much greater whole and thankfully plays into the next book that has gone back to the original narrator. What an amazing imagination - you have to love it! Epic scope, amazing characters, filled with many unexpected and pleasant surprises - a must read! I have been listening to the entire Crydee series of books. TWENTY SEVEN books in a row narrated by the same narrator - Peter Joyce. He was reasonably consistent throughout the series and his voice became everything you expected in every character. Suddenly the twenty-eight book is narrated by someone else. Now it's not just that the narrator has changed, it's that John Meagher is a very poor narrator indeed. I keep screaming at him while listening! What makes a poor narrator that ruins a story? He talks way too fast. Every sentence is said like he is in a race, and there is barely a pause between sentences. 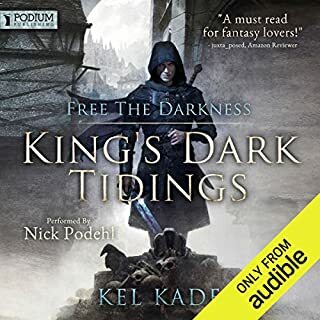 I cannot believe that this close to the end of such a huge series by such a well-known author, it can be totally ruined by anyone having paid money to such a poor narrator. 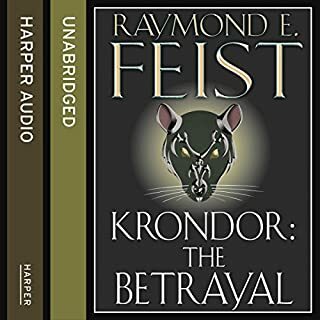 Very bad narrator compared to previous books. Almost made me return the book. Glad they returned to the original narrator in the last book. What would have made A Crown Imperilled better? Why did they not stick to Peter Joyce who narrated all the first two books in this trilogy bewilders me. It's jarring, all the pronunciations of characters is not slightly different, but massively. Also the style of narration is flat with no emotion and monotone making it difficult to bother listening too. It may just be bearable if all three in this trilogy were read by the same narrator but to use one for the first two then switch is unfathomable and ruined the whole set for me. Would you recommend A Crown Imperilled to your friends? Why or why not? 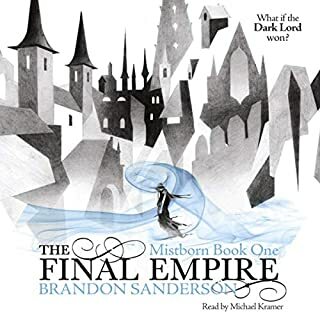 Narration ruined this, so much so after 1/3 of the book i just gave up and bought the actual book and read it so i could find out what happens in the end of the series. If you could sum up A Crown Imperilled in three words, what would they be? Listened to all the others and Peter Joyce does a good job of narration. Imagine my annoyance to find him gone for the next one. I'm trying to listen to it, but an hour in i want to pull my hair out! Who might you have cast as narrator instead of John Meagher? The narration is horrendous and flat! Why oh why would they not use Peter Joyce on this book?! This is the third part of a trilogy and I can't even bring myself to finish it because of the narrator. I tried to listen to it for several days and just couldn't handle it. Extremely disappointed with it. Not even sure how good the story was as I couldn't complete it. If I could give minus stars I would. Yes the story was enjoyable, but the narration was terrible. What was one of the most memorable moments of A Crown Imperilled? The disappointment of listening to John Meagher is all encompassing. By having Peter Joyce re-record it and erasing this version from history. Did A Crown Imperilled inspire you to do anything? Yes, write this review to suggest that the story is re-recorded. Keep John Meagher well away from narrating fantasy novels.... any novels. Just started and already annoyed. It beggars belief that you would change the narrator for the second to last book in what has been a fantastic series. Peter Joyce did a fine job, so why change. Sounds like a cartoon, takes away all the atmosphere of what should be building up to a grand finale after nearly 20 books. Absolutely disgusted. Please refund my money and have peter do the book properly. This is a joke. Rated the story 1 because can't finish. Unfair for Raymond cos I know it will be good. Changing narrators after 20+ books, for ONE book?! What disappointed you about A Crown Imperilled? 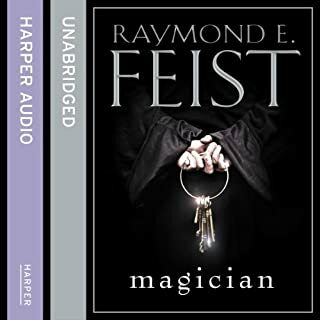 I have enjoyed listening to all Raymond Feist's Midkemia novels from Audible; in fact, the only reason I crated an Audible.co.uk account was to purchase these books. 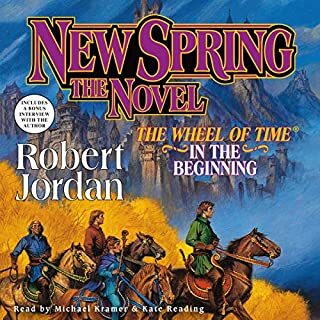 Imagine my disappointment when, after buying 20+ books, I find out that the SECOND TO LAST BOOK in the entire world arc, spanning many individual series, has a different narrator. 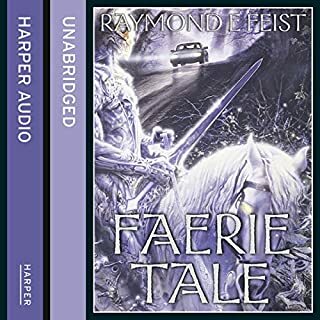 In a trilogy, you get a different narrator for the second book? At least they realized their foolishness and got Peter Joyce back for Book 3. I really hope this book gets re-recorded at some point by Peter Joyce, so I can listen to the entire set of stories without feeling yanked about and wanting to tear off my ears like this book makes me consider. Changed the narrator, this one is no way near as good. Please bring back Peter joyce! I'm sure this is a great book but I stopped listening after 3 minutes because of the terrible narration. Why use Peter Joyce for every book in the saga and then for the 2nd to last book got with a totally different person?Also Peter is back for the final book, so it makes even less sense.Please, please, please get this re-recorded with Peter. John's delivery is poor, and he provides none of the characterisation that Peter offers us. It just seems bizarre to make such a change so late on in the saga. 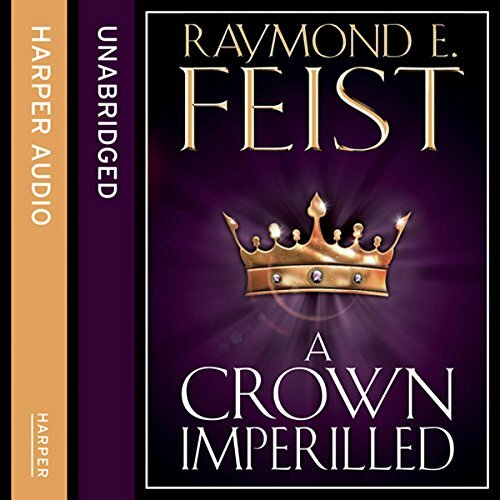 What character would you cut from A Crown Imperilled? I'll have to buy this one book in paperback now, as I just can't listen to it as it is. I would like my credit back as I won't be listening to this book! Narrator change - Brian blessed to Bart Simpson. The change in narrator is so jarring. He sounds like a little American kid compared to Peter Joyce who has done every other main entry in the series and has a wonderful tone of voice. 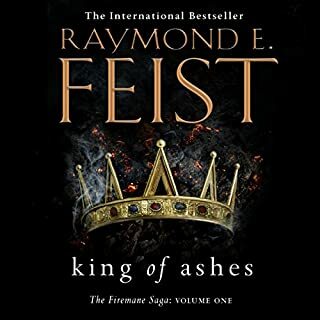 I have read all of Raymond Feist's books before more than once but not sure if I will make it through this audio book the narrator may prove to be unlistenable to me. As I said great book. Inexplicable that someone employed this talentless child to narrate this book when Peter Joyce has delivered fantastic narration of all the other books.